Say that one more time, in your head or out loud, “chocolate banana strawberry smoothie”. Sounds pretty delicious, right? This smoothie tastes so good you’ll have to remind yourself more than once that it’s also very healthy. If I ever create a dessert smoothie category this will be the first smoothie I add. I’m sure you want to skip ahead to the recipe and make this smoothie right away, and I don’t blame you, but I’ll list a few of the health benefits for those who are interested. 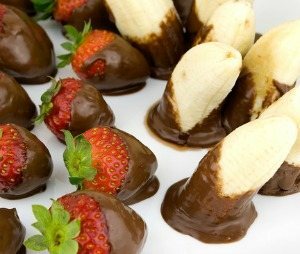 Heart Healthy: Bananas, strawberries, and cacao are all excellent for cardiovascular health. The potassium and fiber in bananas, antioxidant and anti-inflammatory action of strawberries, and theobromine in cacao all contribute to a healthy heart. Antioxidants: As mentioned for strawberries, bananas and even more so cacao all combine to deliver a good dose of these free radical scavengers. Digestion and Elimination: The fiber from the fruit help move things along, if you know what I mean. Brainy: Cacao and cinnamon contain nutrients that enhance cognitive function. Stabilize: Strawberries and cinnamon both help to regulate blood sugar levels. Nutrients: Last, but not least, the ingredients in this smoothie are loaded with vitamins and minerals that support over all good health. You’ll also get added nutrition from the milk you use for this recipe. I went with raw goat milk – other healthy milk options such as almond, coconut, and hemp are just as good. Enjoy! I’d love to hear what you think of this decadent chocolate banana strawberry smoothie in the comments below. Happy Blending! It tastes great! I used all natural ingredients. I used Almond milk, natural cacao powder, natural honey, Maca powder, some natural cinnamon, and of course the banana and strawberries were fresh. It tasted wonderful and I made some for when I wake up in the morning. Great recipe! Hi Zofia, I’m assuming you had the best day ever after drinking this superfood smoothie :) Thanks for sharing! I used a little too much cacao powder, but still, was a great smoothie! By the way, I couldn’t find the place where i could sign up for the free ebook? I get carried away with the cacao sometimes myself :) Good to hear the smoothie turned out well. You’ll receive an email shortly to opt into my newsletter and receive my free eBook. You’re welcome, Agnes! Nice to hear you enjoyed this recipe and added a twist of your own with peanut butter and rolled oats. You’re welcome, Mary. Great to hear you enjoyed it with the kale. Thanks for sharing on FB. I doubted it would taste good and that there was enough cocoa, but it was DELICIOUS!! Thanks for the recipe!! Does the nutrition info include the protein powder? Yes, nutrition information does include the protein powder, Jaja. Hey Ryan! Im a college kid who got a blender for christmas, and have been going wild with all of your smoothie recipes! This one is my favorite so far, along with the pineapple banana recipe Corrine shared with you! Thanks so much! Comments like yours make my day, Jack! Thanks for sharing.